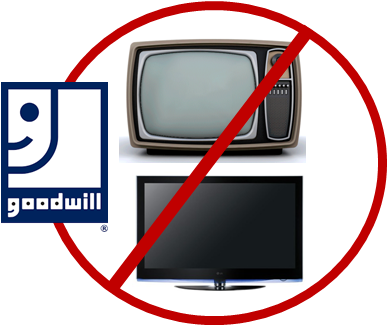 JOHNSTOWN, PA, August 8, 2016—Goodwill of the Southern Alleghenies has announced that effective immediately, it will no longer accept donations of televisions at any of its donation locations due to strict government guidelines and the high costs of proper disposal of e-waste. The agency operates donation locations in the counties of Bedford, Blair, Cambria, Huntingdon, Indiana, Somerset, and a portion of Westmoreland. Studies show that the component materials of electronic items threaten human health and the environment, especially water and air. Cathode ray tubes (CRTs), the glass picture tubes found in televisions, contain five to eight pounds of lead. Components in flat screens also pose a health risk. Many landfills refuse to accept electronic products, or they charge a hefty disposal fee. Goodwill is often left with piles of televisions that they have to pay to dispose of safely, which diverts dollars from the critical human services they provide their communities. “We appreciate the public’s diligence in helping Goodwill to avoid the high costs of e-waste disposal. This will allow us to instead direct revenues toward our mission and the people we serve,” stressed Goodwill President and CEO, Bradley R. Burger. Residents are encouraged to contact their local municipalities or solid waste authorities for direction on the recycling of hazardous waste. While Goodwill will no longer accept televisions, it will continue to accept computers and related equipment, which are recycled through a partnership with Dell.